_“I am now 80 years old, but I always carry with me the gratitude I have for you and other Covans for your service in the long and difficult Vietnam War. I never forget that you had saved my life when I was critically injured on the night of January 06, 1969 in Ca Mau. You, especially, are not only my brother-in-arms, but a true friend. When I think of the battles of Mau Than and Boi Loi, Tay Ninh, in 1968, I think of you because you were the Covan of the famous 2nd Vietnamese Marine Corps Battalion (Trau Dien). Together, we fought these battles valiantly. Do Son’s daughter, Theresa Ngo, recently moved to San Diego. Her Department at Lockheed Martin in San Jose relocated in San Diego and she moved with her job. Her husband and children still live in San Jose and would reunite with her at a later time. 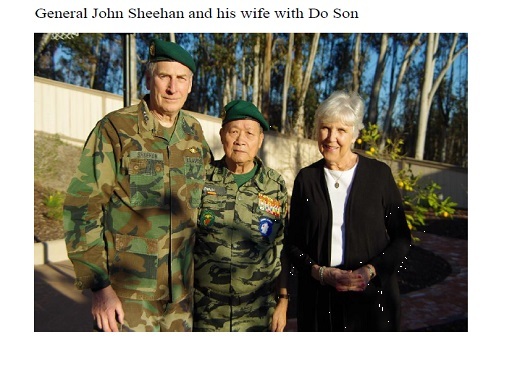 Do Son told General Sheehan that he planned to stay with his daughter, and would like to invite General Sheehan and his wife for a Vietnamese dinner at his daughter’s house. 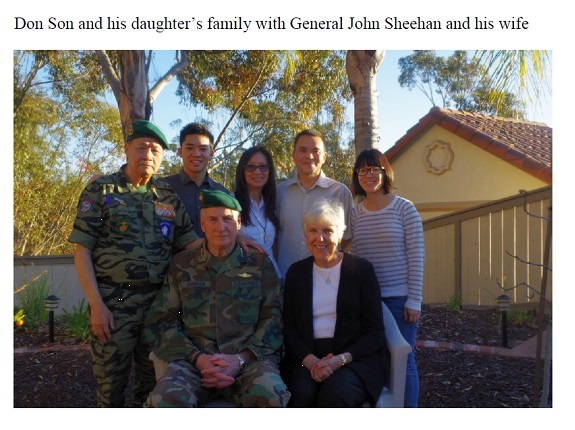 General Sheehan had originally suggested a get-together at a Vietnamese restaurant but decided to accept Do Son’s offer for a reunion at his daughter’s house. 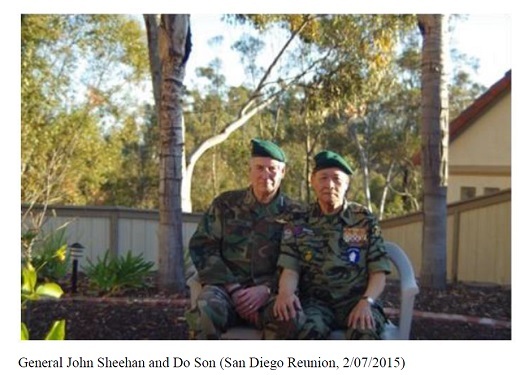 Before travelling to San Diego, Do Son had asked me (To Van Cap) to join Do Son for a reunion with General Sheehan. I regretted I could not make it due to personal reasons, knowing I may not have a second chance to join them for a reunion like this. When Covan Sheehan met Do Son, he was in his U.S. Marine combat fatigue. In the same manner, Do Son greeted his Covan in his TQLC combat fatigue. It was 46 years ago that they fought side by side and then went on their separate ways. The reunion was long overdue for them to renew their friendship, and to catch up with soldier’s life and death stories between them during the Vietnam War. Meeting Do Son’s daughter, Theresa Ngo, General Sheehan told her that he had met her before in Vietnam. Do Son was surprised but remembered that his wife had took Theresa to visit him upon the Battalion return from a combat mission at the Trau Dien Battalion Rear Base Camp in Thu Duc, 1968. Theresa was only seven years old. Not only General Sheehan has a very good memory, but he is a great ice-breaker. He put everyone at ease in joining the conversation. 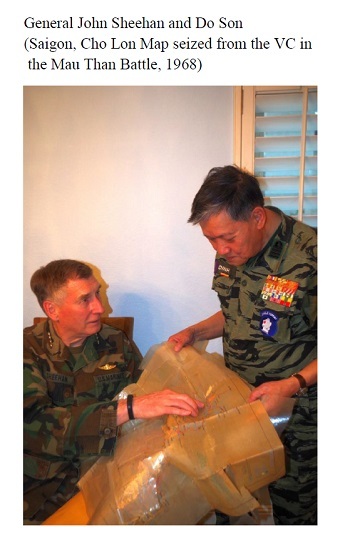 The reunion between General Sheehan and the Trau Dien Battalion Commander on February 07, 2015 speaks of an unbroken bond between a South Vietnamese Marine and his Covan. The last time they were together was 46 years ago. Since then, the Covan had risen to the top of his military career to become a four-star General of the United States. 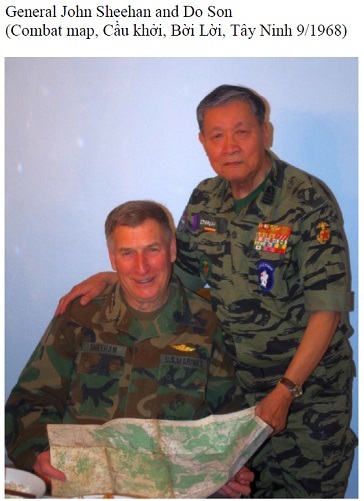 With all those 46 years, the General has never forgotten his South Vietnamese Marine whom he served as a Covan, and neither was the South Vietnamese Marine who has always remembered his Covan as his brother-in-arms, and also the one who had saved his life. My very dear friend; first, I am happy that you are better. , I am also very touched by your article. I will always treasure our professional and personal relationship. I think you underestimate how much you taught me. I became a better officer because of my relationship with you and the other Marines of Trau Dien. The one thing I have learned over the years is that rank is not as important as friendship. The bond created by being a band of brothers stretches over time and distance. The kindness shown to Peg and myself by you and your family will always be remembered. Please pass my thanks to Yvonne and warm regards.